Here we are - back for another week of project sharing! 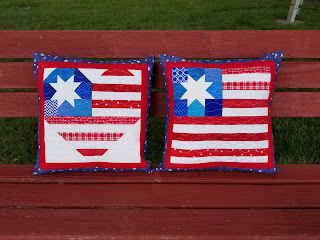 My share this week is the start of one of my Christmas in July projects. Before cutting into fabric, I spent several hours at the computer working out the design until I was satisfied it could be sewn. And yesterday was the big test - cutting, sewing, and bringing it to life. It's now in the flimsy stage, waiting for quilting, while I work on the second Christmas project. 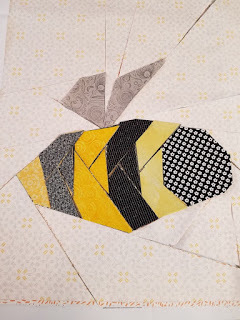 and from Dreamworthy Quilts, this cute bee. Now it's your turn - come link up! 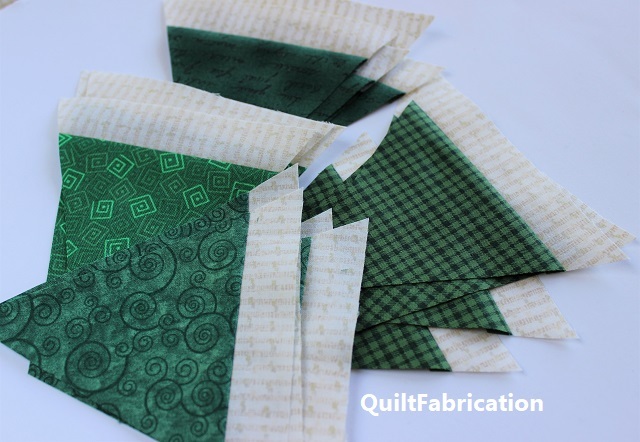 I love those greens, cant wait to see the finished block. Looking forward to seeing your Christmas project! I still can't even think Christmas anything! I'm glad there are people like you who do...it slowly, gently nudges us to at least consider a holiday project! Can't wait to see what you come up with! I'm anxious to see what you have made with those triangles. Thanks for the feature and hosting the linky party each week. Those triangles are pretty - and intriguing! Don't you just love Christmas in July? Oh, geez, Christmas!! Our local fair's quilt challenge this year is "Christmas in July" and I'm finishing that up today.